This post was made in partnership with Vinho Verde Wines. Recipe and ideas are my own. Labor Day will soon be here. The end of summer is in sight…sigh. But I’m going to stretch these last few weeks of warm days and cool nights the best way I know how! With a picnic! Picnics sure have changed a lot since I was little, obviously. There’s definitely wine now. However, the bugs are still there in droves. But I get to stay out a lot later so…win! Today I’ve partnered with Vinho Verde Wines from Portugal to help you find an easy, breezy way to celebrate summer’s last hoorah. The Vinho Verde wine region has been producing these young wines for over 2,000 years and is home to Portugal’s largest wine region. While 86% of their wines are white, they also produce some red, rosé and sparkling wine as well as brandy. These wines are also super affordable, and pair well with food. In other words, a great picnic wine! Don’t think of these Vinho Verde wines as a summer sipper only though; they transition from Summer right into Fall and are the versatile wine to keep around all year long. For our Labor Day picnic I’m bringing along this Avesso wine from the Vinho Verde region. This refreshing wine has aromas of citrus, peach, and almond with a slight acidity and touch of minerality. You can enjoy it on its own, but it’s also wonderful in a spritz cocktail, which we’ll make and take along. You can’t have a picnic without some great picnic food too. And if we’re drinking Portuguese wine, we are definitely eating Pastéis de Nata (Portuguese egg tarts). These light, slightly sweetened tarts hold up well outdoors. I have a few bakeries here in Los Angeles that I like to buy mine from, although I’m linking to a solid recipe below if you’d like to bake yours. I do like to dress mine up a bit for the picnic with some wine-candied lemon peels which I DO have a recipe for below using the same wine we’ll make spritzes with. I’m feeling so ready to spread out a blanket, have a few spritz cocktails, and snack on some yummy tarts. I can feel that warm, late summer breeze now. So let’s open that wine and start putting this picnic together! A picnic should not be a stressful affair. Here’s some tips to help make your day go off without a hitch! Pre-batch the spritz mix! The night before, measure out all the ingredients minus the soda water. Refrigerate the mix, and the next day bring along some ice, portion out the drinks, and top with the soda water! No time to bake egg tarts, but want this transportable, delicious picnic snack? Buy them! Both Portuguese and Chinese bakeries are home to wonderful egg tarts. You don’t need a picnic basket! Sure, they’re cute, but if you don’t have the space, or the desire to buy one, some reusable bags, a cooler, or even an old Amazon box will do. If it holds stuff, use it! A combination wine opener/pocket knife. I’m a big fan of Opinel knives and they have a beautiful combo one. Get that wine open, zest a lemon, and cut up some tarts. Maybe whittle some sticks for marshmallow roasting later. It’s a like a picnic swiss army knife, but with only the most important tools. And speaking of gadgets to have outdoors, I really love a double insulated wine chiller. If I’m going to be hanging out in the sun for a few hours at a picnic, I want to keep my wine cool. In a shaker filled with ice, pour in Avesso Vinho Verde DOC Wine, elderflower liqueur, Bitter Bianco, and lemon syrup. Shake 20 second and strain into a wine glass. Add fresh ice and pour in soda water. Stir gently to combine and garnish with lemon wheel. Using a wide vegetable peeler, zest the two lemons into wide strips making sure not to include of the white pith. Cut strips into quarter inch wide strips. Place strips in a small sauce pan with 2 cups of water. Bring to a boil. Boil 5 minutes uncovered. Drain. Rinse in cold water. Return the lemon strips to the pan. Add in 1/3 cup sugar, 1/3 cup water, and wine. Bring to a boil and continue to cook until a syrup forms. About 8-10 minutes. Turn to a simmer and simmer 5 minutes until peels are translucent. Remove from heat. Pour remaining sugar onto a sheet pan and spread evenly around. Using a slotted spoon or fork, remove peels and place on sugar. Toss to coat peels in the sugar. Separate peels so none are sticking together. Move to a drying rack and let sit about one hour. Store in an airtight container. Will keep several months refrigerated. Save syrup from pan into an airtight container. Refrigerate. Will keep up to one month. Garnish tops of Pastéis de Nata with a few strands of the wine candied lemon peel and a few drops of their syrup. **Feel like making your own tarts? Check out this recipe from Tasting Table for Pastéis de Nata. Are you going to Tales this year? Can we meet at Tales? I’m reaching out to you about meeting up at TOTC… Sorry guys, I did not attend Tales of the Cocktail this year. I really don’t know when I’ll make that happen, if ever. However, I was able to bypass the crowds and the sweltering, miserable 105° heat with god-knows-how-high humidity and just look at everyone’s Instagram and Twitter and quite frankly that was great and totally enough, thanks. But I’ll save those thoughts and actions for offline, where I can actively do things and not just type type type on here. Anyways, to say the least, I’ve been pretty uninspired with drinks lately. I recently read on article on the End of the Craft Cocktail Movement, and while I initially wanted to get cocky and yell in an obnoxious manner no it’s not, I had to give the author a nod for touching on some truths. The truth being that, yeah, you can get a good cocktail practically anywhere and we as cocktail drinkers have come to expect that now. It’s not novel to be craft and to use fresh ingredients and make your own bitters and muddle in some cucumber. We ALL know how to do that and that’s a good thing. The scary part for people like myself is how do we move on from there. When I was perusing the images from TOTC, one of the most intriguing things I saw was on Craft & Cocktails’ twitter. It was 4 images of weird stuff with the caption that they were “all cocktails”. You can see that post here and read my comments on it below. To sum up, I was most into the weirdest, the most wrong, the most confusing cocktail of the bunch that was a glass with what looked like dentures sitting in it. Spectacle. We’re now moving onto spectacle. When we all expect what’s in the glass to taste great, you’re going to need a 3 ring circus to bring the audience in, at least when we’re talking about here in the blog/social media world. There has been a trend with the younger, newer drinking age audience to stop making drinks at home and to cease entertaining. Their eyeballs are glued onto their phones looking for the next great cat bar, not to necessarily go there, but to “like” the idea of it and quickly move on to the next strange idea. This is a weird spot to be in when you’ve been happily plugging along on your website, coming up in the (second? third?) craft cocktail movement and sharing a love of home bartending. The newer audience will not be home bartenders, and the audience you’ve been talking to is going to start getting home bartending fatigue. Even I see that in myself. I’ve stopped reading a lot of sites, even ones I’ve loved, and stopped browsing through a good chunk of the social media sites, and instead started reading more actual books again. I chuckle at the newest hashtag of #readafuckingbook and am actively giving my brain a break from the nonsense and just the relentless tragedy that coexist in the same feeds. And so, here’s a little spectacle, wrapped around a good drink. The good folks at Copper & Kings just released an orange Curaçao that is pretty darn great and I added that into my variation here on a Brandy Crusta. First, I swapped some California rye whiskey in for the brandy and then instead of the sugar crusted rim and lemon peel, I made some lemon zest infused sugar and spun that around the glass. The sugar looked like amber when it hardened, and it made me happy to look at it. Like a little artwork on my glass. I hope you all find a little something that makes you happy this week. In a mixing glass 2/3 filled with ice, pour in the whiskey, lemon juice, orange curaçao, maraschino liqueur and Angostura. Stir to chill 20 seconds and strain into lemon-sugar crusted glass. In a small saucepan over medium heat, combine sugar and lemon zest, stir to combine. When sugar starts to melt, stir constantly until sugar reaches a golden-brown color. Remove from heat immediately and continue to stir. As the sugar mixtures begins to cool, the liquid will thicken. Sugar is ready when a wooden spoon is dipped in and sugar pours off in a ribbon. Dip a coupe glass into the sugar and slowly pull out, twisting the sugar as you remove the glass. Hold upside down for about 30 seconds and then stand up to finish cooling. Set aside until ready to use. Winter is officially citrus season, which always seemed so bizarre to me. Why would this bright, summery feeling fruit be a winter crop? Maybe to cheer us all up during those dark winter days? Well, drink (or make!) a few of these citrus concoctions and you’ll be smiling soon. I’m not one to tell you guys what to do, but if you’re looking for something to make this week for your holiday table, here are a few suggestions! Happy Thanksgiving everyone! This post is brought to you by White Claw Hard Seltzer. Recipes and ideas are my own. I could drink green tea all the live long day. I’ve convinced myself it’s a cure all drink; tired: drink tea. Feeling like I’m about to catch a cold: drink more tea. Stressed: GREEN TEA. But it’s also my secret cocktail ingredient. Green tea adds an earthy layer of flavor that gives a touch of savory to whatever drink you add it to. The summer months mean I switch from hot to iced tea, and now I include big squeezes of lemon, and maybe a little simple syrup. OK OK, I’m making green Arnold Palmers half the time and today I’m using that as the base for my new summer cocktail with White Claw Hard Seltzer. You might not have heard of this brand before and that’s OK. They’re not only brand new on the market, but hard seltzer is a whole new category unto itself. The best part of adding them to cocktails is that they’re all natural and additive-free. You guys know I just can’t tolerate the taste of synthetic–yuck. To add some effervescence to my cocktail, and just a hint of sweet fruit juice, I chose their Black Cherry flavor (my husband’s favorite) to compliment the earthy green tea and tart lemon. The seltzer is only 5% alcohol so I paired it with some white rum to round out the cocktail. I’m loving this cocktail right now as I’m sweating to death here in Southern California. It’s so refreshing and light which is what I’m looking for with my summer drinks. Who wants something heavy and sickly sweet? And even though the White Claw Hard Seltzer is delicious all on it’s own (they come in 12 ounce cans you can just throw in your fridge for a chilled low cal drink anytime), it’s a great addition to my summer drink line up. So let’s crack a can open and start mixing! lemon wedges and cherries for garnish. In a highball glass, build your drink by filling your glass with ice. Then add in white rum, lemon juice, green tea and top with White Claw Hard Seltzer. Stir gently to combine. Garnish with lemon wedges and cherries. In a small sauce pan over medium high heat, combine sugar and water and bring to a boil, stirring to dissolve the sugar. Once a boil is reached, turn off heat and remove the pan from the stove. Add in the two tea bags and steep for 5 minutes. After 5 minutes remove the tea bags and let cool. When the syrup is cool, use for drinks or store in an airtight container in the fridge for up to one month. This post is brought to you by Blue Nectar Tequila. Recipes and ideas are my own. Admittedly, I let a lot of the drink holidays pass me by. Especially when they’re not really something I feel like celebrating (vodka + red bull day I’m looking at you). But today is a very special day. Today is Margarita Day. I drink Margaritas every day of the year. I don’t wait for Taco Tuesday and happy hour at my local cantina. I break them out over brunch or on any given Sunday. But usually just a single serving or two. Today, because we’re celebrating, we’re going big and making a Margarita PUNCH. Since we’re still deep in citrus season, my family just got back from picking our own grapefruits, lemons and whatever else was hanging on those fruit-laden trees. The grapefruits were so juicy and tart and delicious, that I perhaps got a little overzealous with the picking. To make sure they go to a good home, they’ll be the base of the punch today. Not only will we use some of the juice, but the zest will go into the oleo saccharum, and the whole punch will get garnished with sugared brûléed wheels of the fruit. An honorable way for these grapefruits to go. Even though I love those grapefruit, to balance out the citrus flavors and make the base more complex, I’m creating a oleo saccharum with lemon and lime zest in addition to a few grapefruit zests thrown in. Creating the base this way gives the punch a strong citrus backbone that won’t get watered down and lost once the grapefruit juice, tequila and ice are added in. To sweeten everything up and to highlight some of the more floral characteristics of the citrus, I’ve combined Tahitian vanilla (which is the most floral of the vanilla varieties) and piloncillo. Not sure what piloncillo is? That’s ok, I’ve only just started using it over the last few years myself. Piloncillo is evaporated sugar cane juice from Mexico. It’s not as sweet as regular cane sugar, but it has a wonderfully rich taste, similar to brown sugar. Again, to make this a more concentrated flavor bomb for the punch, the vanilla and piloncillo get made into a syrup and then reduced into a rich, syrupy sweetener. This wouldn’t be a Margarita without the tequila, right? For that I’m turning to Blue Nectar Silver Tequila for the perfect pairing to my grapefruit obsession. The clean vegetal flavor has just a touch of spiciness that balances out the sweetness of the citrus. This is a versatile punch: serve it up with breakfast tacos or late in the afternoon all by itself; anytime really. But especially today, for the best drink holiday, Margarita Day. For more information on Blue Nectar Tequila, please check out their website here! To make the oleo saccharum, peel zests from limes, lemons and grapefruit, trying to remove as little white pith as possible. Toss the peels with the sugar, muddle to express oils, and let sit 6 hours or up to overnight in a nonreactive bowl (I use glass or a cambro container), covered. Strain peels from the mixture, set liquid aside. In a small saucepan over medium high heat, combine piloncillo, water, and vanilla pieces. Bring to a boil and then reduce heat to a simmer. Simmer, uncovered, until mixture is reduced by half. Strain vanilla pieces out and store in an airtight container until ready to use. Will keep refrigerated up to one month. To make the punch, combine Blue Nectar Silver Tequila, grapefruit juice, reserved liquid from oleo saccharum, vanilla and piloncillo reduction, lemon juice and dry orange curacao. Stir gently to combine. Chill mixture. To make the brûléed grapefruit wheels, place sliced of grapefruit on a wire tray over a cookie sheet. Sprinkle them with piloncillo sugar. Place them under a broiler, or use a culinary blow torch to caramelize the sugar and wheels. Let cool. Once the wheels are cooled, reserve 3 wheels for the punch bowl garnish and slice the rest for garnishing individual cups. To serve, pour mixture into a punch bowl and add a large block of ice. Garnish with large brûléed grapefruit wheels. Ladle into individual cups with wedges of brûléed grapefruit. Optionally sprinkle with sea salt crystals. I tend to go back and forth on bottled cocktails. Will the juice taste fresh enough? Should I even bother with juices or should it be all booze and bitters? Can I just drink this whole bottle and not share it? Let me introduce you to your new best friend, the insulated thermos. Keeping your hot cocktails hot, and your sanity in check this winter. When you’re making hot cocktails there are a few things you need to keep in mind. First, you’ll be adding in hot water so you want to keep your juices to a minimum (if your cocktail requires them). Why water your cocktail down even more? I’ve found the best way to work around this is to make an oleo saccharum to ensure you have that bright zesty citrus flavor in concentrated form and none of the excess juice. Second, you want to keep your cocktail hot. For my thermos cocktails, I use a Stanley Classic Vacuum thermos . It’s old school looking; like something my Dad would bring with him to work to keep his soup hot. And this guy keeps it hot for HOURS. At 1.1 quarts it also holds enough drinks for you and some friends so no one need go without a drink. But don’t just pour your drink into the thermos! If you preheat it while you’re making the cocktail it will prevent heat loss when you pour the drink in. So, to do that, just add boiling water and stick the cap on while you’re doing the mixing. Anywhere from 15 to 30 minutes is sufficient time to get that thermos nice and hot. When you’re ready to pour the finished cocktail in, dump out the water and you’re good to go. Third, make a cocktail that actually tastes good hot. For my first venture with the thermos, I made a variation of a Hot Ward 8, Boston’s only real pre-prohibition contribution. I’d love to tell you the history on this but there is so much competing information out there as to its true origins that putting anything down in print seems like hearsay. I chose this for a few reasons. I thought it would taste good hot, and it uses up some seasonally appropriate produce (Are your kitchen counters filling up with citrus yet? Mine are.). You could always go with some cocktails that are already served hot. Some nice Hot Toddies while you’re ice fishing, or some Irish Coffee while you’re out snow-shoeing, or whatever you do in the snow. The Ward 8 delivers a bit more complex flavor here with sweet and spicy rye and that bright citrus from the oleo saccharum. I also add in a touch more syrupy citrus sweetener with a dry orange curaçao and round out the drink with tart fresh pomegranate juice (the last of my season’s batch). For a spicy/bitter finish, a few dashes of Angostura are added in to the mix to keep it from getting too sweet. There’s plenty of cold months ahead of us, so let’s start planning on a few hot cocktails to get us through. And don’t forget your thermos. In a heatproof container with at least a 36-ounce capacity, toss together lemon and orange zests with sugar. Muddle for 30 seconds to release the oil from the zests. Cover and let stand at room temperature for at least 8 and up to 12 hours. Discard hot water from thermos, then carefully strain rye mixture through a fine-mesh strainer into thermos (a funnel can help avoid spills); discard spent zests. Seal thermos. Optionally, when ready to drink, add new lemon zests to your cocktail, expressing the oils over the top first. It may be January but I’m still in good spirits riding the Christmas high. That is until my husband kindly asks that the Christmas lights be removed from the porch (I’m trying to hold out until at least February). For those of you though that have shrugged off (or exuberantly put a nail in) the holiday season, I’ve got something today that perhaps will add some sparkle back into your January. Not only pitchers, but bright and warm, sunny yellow Suze with a good dose of winter citrus and an even bigger dose of sparkling wine. No hard booze here so you can tell yourself you’re still keeping to your resolutions. Our New Year’s Eve tradition, at least for the last few years, has been for Christopher to make a batch of Scotch eggs. He almost bowed out of it this year but I balked at the idea of not continuing making them; I may have developed a slight superstition and now we cannot ring in the new year without them. One of the ingredients that goes into the sausage mixture is sage. And seeing as I have yet to keep a sage plant alive around here, we buy it. Alas, you cannot get sage in any small amount at our Whole Foods, so we always end up with much more than we need. I already had dried the last batch we bought, so I thought that this cocktail could use a touch of the herb. I dunno guys, sage might become the new rosemary around here. The sage leaves get steeped into a lemon simple syrup to add a little depth. 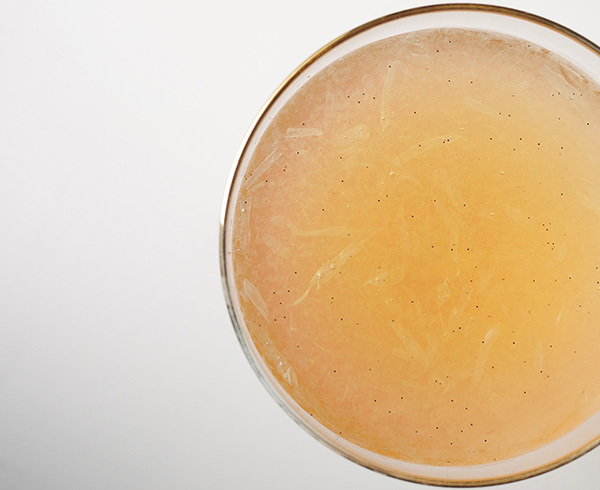 To further enhance sage’s flavor, we’re mixing it with Suze, a saffron-colored French aperitif whose bitter yellow gentian root flavor makes it a cousin to the Italian amaro family. It has hints of citrus and wildflower, and balances a mild sweetness with vegetal bitterness. You might want to invite some guests over for a few casual drinks before dinner, or even serve this at a brunch. While the base can sit overnight, and then be topped off with Cava in a pitcher so that guests can help themselves, you’ll want make sure it doesn’t sit out for long after the bubbly has been added. No one wants a “sparkling drink” that’s flat and warm. Combine water, sugar, lemon juice, lemon zest, and sage in a medium saucepan over medium-high heat. Bring to boil, remove from heat, and let stand 1 hour. Strain and refrigerate in an airtight container up to 1 week. The night before serving, combine the lemon-sage syrup and Suze in a large pitcher. Cover and refrigerate until ready to use. When ready to serve, add Cava, pouring slowly, and gently stir to combine. Split between six Champagne flutes, twisting a lemon zest strip over each and garnishing with a sage leaf. I originally posted this recipe on Serious Eats! Remember when I said I’d never use Snapchat forever and ever? Yeah, about that… Guys, ugh, talk about going down a rabbit hole of watching people make coffee and take bad selfies. And yet, I’m so compelled to WATCH. Actually, right now, I love seeing how people decorate for the holidays, and Snapchat itself has compiled these little videos of people celebrating for the holidays all over Europe. What I think I’m trying to get across here is that I’M SO INTO CHRISTMAS THIS YEAR. Yes, yes, it might seem like I am getting a bit overexcited about something that happens every year, but for the last few Christmases I just couldn’t be bothered. This Christmas I have forced myself to be in the holiday mood since about November 27th and I plan on keeping it up until at least New Year’s. While I have done my requisite decorating, I have now turned to holiday-izing my food and drinks. For all of you reading this right now, I will just focus on the drinks. Holiday Punch. This is almost without a doubt my main cocktail situation for big parties, and especially those of the Christmas kind. You can batch it beforehand and let guests get as tipsy or not as they want and you still get lots of credit for making it (but we all know it’s WAAAAY easier than individually making drinks for 40 people at your party. F that.). This year I turn, again (and again and again), to rosemary. I don’t need to go into my rosemary situation, but for those of you just joining us here on the site, it’s OUT OF CONTROL. So into another drink it goes. And this time we’re adding a little fire to the mix and giving the rosemary a little smoke to send your guests over-the-edge with excitement as you tell them you hand smoked all that rosemary they’re drinking. You just won the holiday party this year also, FYI. That smoky rosemary is pairing up with some winter citrus because we want to make this as holiday as possible. Then throw everyone a curveball as you sneak in a few Tiki elements with gold rum, orgeat and grated cinnamon. Oh, and also some high proof rum because WHY NOT?! Our base rum is Parce 8-Year, a small-batch Colombian rum that’s aged in whiskey barrels so it has a similar flavor to single malt scotch, and is DELICIOUS. Now, please don’t be intimidated by the fact we are smoking the rosemary. It’s as simple as turning on a gas burner and throwing the rosemary over it for a minute. Or, seriously, you could use a candle if you just have electric burners. Either way, your house is going to smell amazing come time for that party. And hey, let’s snapchat it to each other while we’re at it. In a medium saucepan over medium-high heat, combine sugar, water, and lemon and lime zest and juices. Stir to combine. Bring mixture to just under a boil, then remove from heat and cover. Meanwhile, hold rosemary over an open flame using heatproof tongs, turning continually, until it begins to smoke. As soon as it starts to smoke, uncover syrup and place rosemary in saucepan. Cover again and let steep 30 minutes. 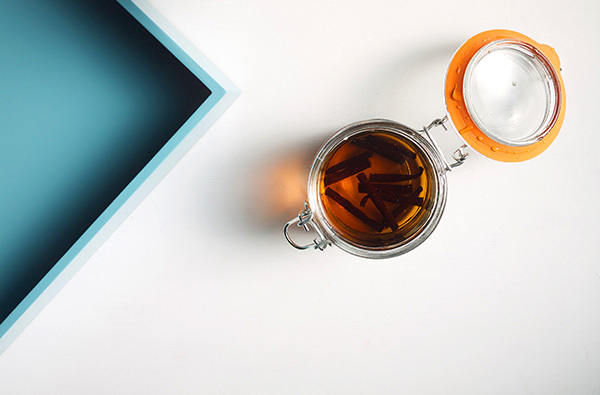 Strain solids out and reserve syrup for the punch in an airtight container. The syrup will keep for up to a month in the refrigerator, but flavors will be best if used within 2 days. In a punch bowl, combine gold rum, orgeat, smoked-rosemary citrus syrup, overproof rum, and water. Stir to combine and refrigerate at least 4 hours and up to overnight. To serve, add a large ice cube to the punch bowl. Ladle about 3 ounces into a punch glass and grate fresh cinnamon on top. Serve. I originally posted this recipe on Serious Eats. *This bottle of Parce 8-Year was generously given gratis and appears here because I like drinking it. For more info on sponsored products, affiliate links, and gifted booze, please visit the About page. 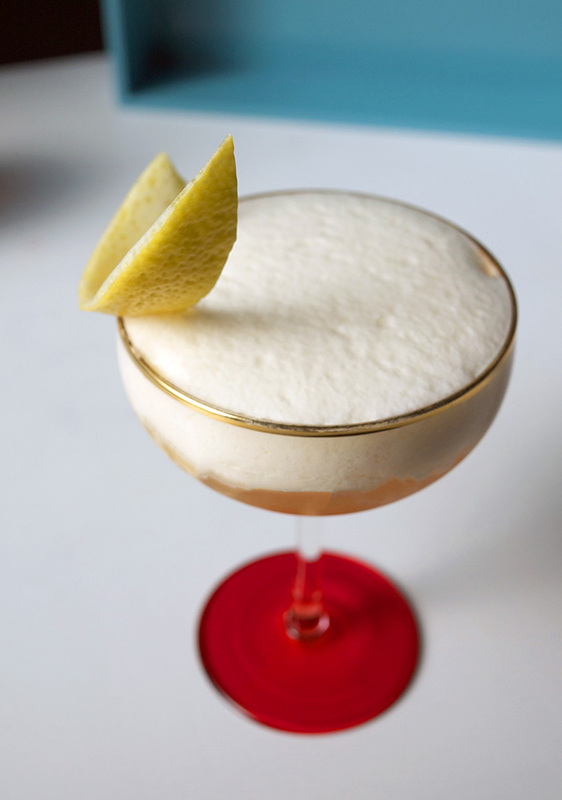 Vanilla-Infused Amaretto Sour with lemon foam! This post is brought to you by Nielsen-Massey. Ideas are my own. Is it too early to start thinking about Fall weather and cozy sweaters? Is it wrong that I may have turned my air conditioning down real low the other day and pretended it was cold outside? Please don’t judge. When Southern California gets its end-of-summer heat waves (that start around mid-August and go through October. Blech. ), I start daydreaming pretty hard about being able to turn on my fireplace and snuggle up to it with something equally cozy. Amaretto might not scream Autumn to you, in fact, it just might make you scream, but I’m a firm believer that a little amaretto now and then is good for you. Ever since I made myself an Amaretto Sour a few years back (on a quest to find things to do with this giant bottle I had acquired), I realized that I had been missing out on a flavor I really loved, and wouldn’t mind more of: almond. But then I went and had too much of a good thing and realized my go-to sour just wasn’t cutting it. What I needed was a little more warm, Fall flavors, and maybe a heaping helping of the unexpected. 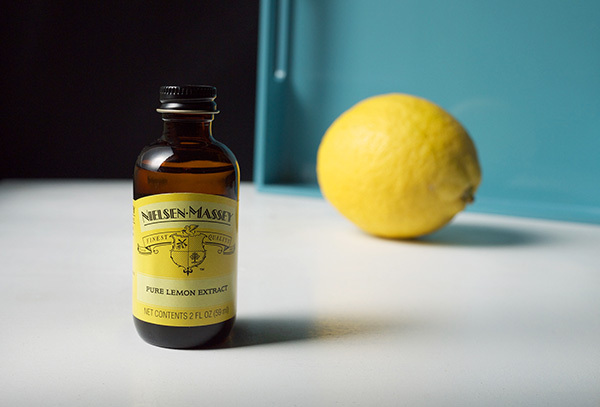 So in stepped Nielsen-Massey’s Madagascar Bourbon (my “all purpose”) vanilla beans and pure lemon extract. And a couple of N2O cartridges for good measure. 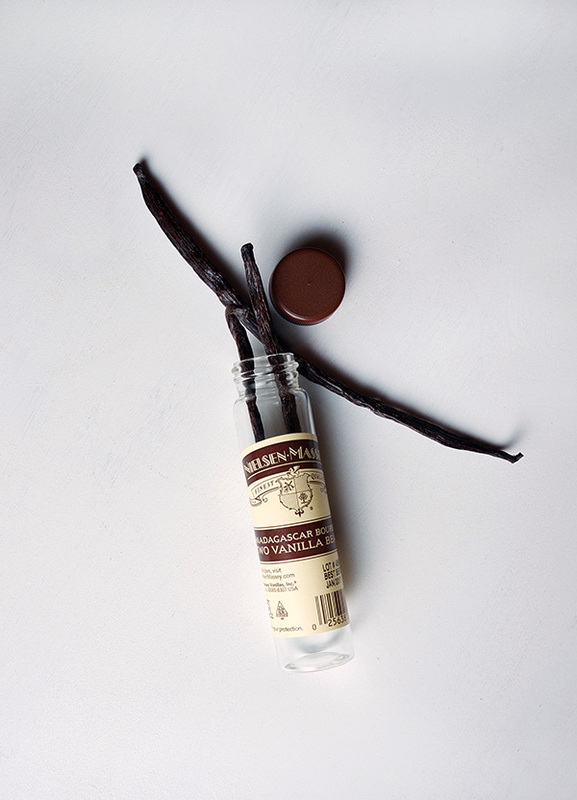 I’ve had Nielsen-Massey vanilla beans, pastes, extracts, you name it, in my pantry for over a decade now (thanks in part to my old job where I had access to the best ingredients Los Angeles chefs could get. Read why they’re a great pick here!). Today I’m excited to team up with them to bring you a cocktail using their amazing, hand picked vanilla beans. Vanilla and almond are a great pair. I stick them in plenty of baked goods, and now I’m sticking them together in a cocktail. I’m also including an egg white, typically found in a sour, but not in your typical way. I make no apologies on here about my love of foams in drinks. Besides looking nice, foams provide a way to suspend aromas above the drink, and also are a lovely layer to taste as well. That silky texture is your first sip before you get to the meat of the cocktail. Here, an extra boost of lemon first greets your nose before you get to the rich vanilla flecked amaretto. 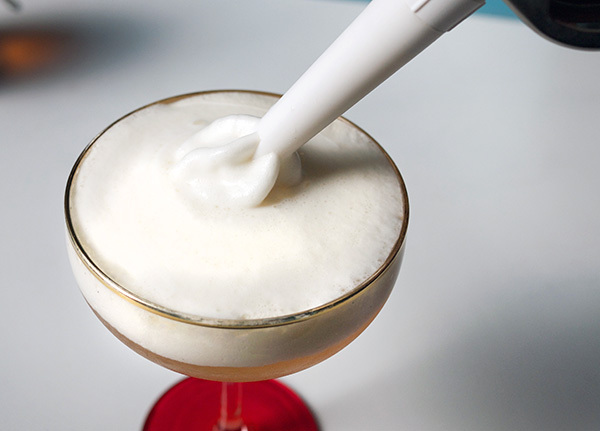 The foam mixes with the cocktail to cut through that richness to make the usual heavier cocktail a much lighter version. So now you have a fun weekend DIY and a whole week to look forward to this delicious cocktail. But… if you can’t wait a week, you can always cheat with a 1/4 teaspoon of vanilla bean paste mixed into your amaretto. The flavor is not as deep as the infusion but works in a pinch! Combine the amaretto and vanilla segments in an airtight container. Shake hard for 10 seconds to release some of the seeds from the pods. Let sit in a cool, dark place for 5 days. Taste test and leave for another day or two if you want an even stronger flavor. When ready, strain pods from the amaretto leaving seeds behind in the liquid. Infusion will keep for 1 year stored in a cool, dark place. In a whip cream canister, add water, egg whites, simple syrup and lemon extract. Seal and charge with one N2O charger. Shake hard and charge with a second charger. Shake again and chill for at least an hour before using. Click here to purchase the whip cream canister and the N2O chargers! 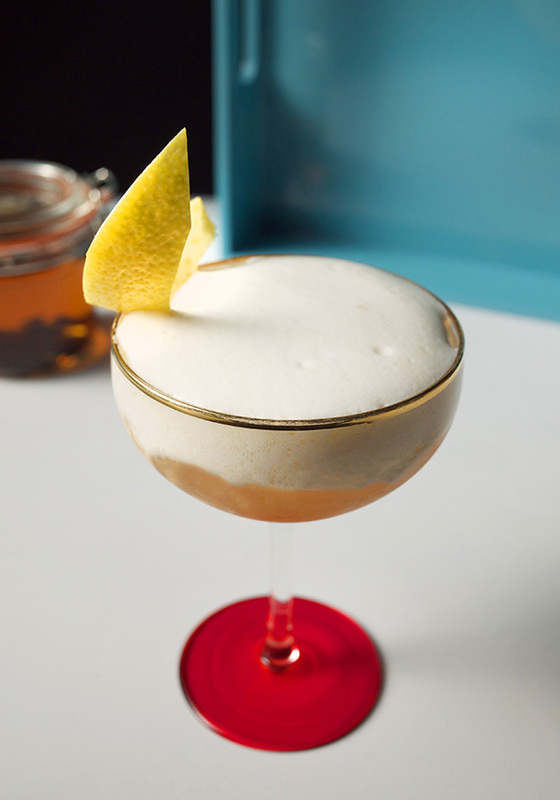 In a shaker ⅔ filled with ice, add the vanilla-infused amaretto and lemon juice. Shake for 20 seconds and strain into a chilled cocktail coupe. Top with about ½” of the lemon foam. Garnish with the lemon peel. For more information on Nielsen-Massey Vanillas, please visit the Nielsen-Massey website or follow Nielsen-Massey on Facebook, Twitter and Pinterest.